"I want creation to penetrate you with so much admiration that wherever you go, the least plant may bring you the clear remembrance of the Creator ... One blade of grass or one speck of dust is enough to occupy your entire mind in beholding the art with which it has been made." -- Basil the Great (329-79), Hexaemeron, Homily V, The Germination of the Earth. Creation & Bees - It's beginning to look a lot like Spring and I'm grateful for that. Have seen some bugs flying around which is quite refreshing. The multitude of birds we have in the winter is very nice ... but I do miss the bugs, lizards, frogs, butterflies, and longer daylight hours to see the evening critters arrive. I've been thinking of bees lately. There is such an amazing variety of them. It sometimes astounds me all of the beauty that God created for us like this honey bee feasting on the flowers. He made provision for all of us in one way or another. Our God is an awesome God! The honey bee eats nectar (sugary water) and pollen (yellow to brown protein powder depending on the flower) which are made by flowers. Babies are fed tons of pollen, to provide the protein they need to grow. The abundance of flowers in the spring (and lots of pollen), make it so that most bee babies are born in the spring. 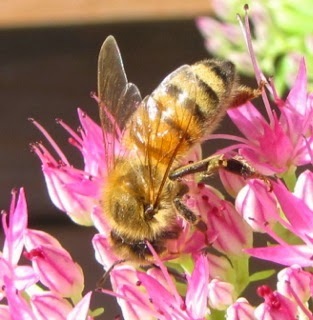 The nectar collected is what the worker bee uses to make honey. The bee arrives at a flower, and proceeds to drink as much nectar as she can hold. She then passes the nectar to another worker bee (the nectar is held on her tongue) so the water in it can evaporate. This way it is highly concentrated, and never spoils. When most of the water has evaporated, the sweet nectar becomes honey, which is then stored in the hive. When all the moisture is gone, the bee then caps the honey for long term storage. During winter, when there aren’t many sources of food in blooming flowers, bees use this stored honey for food sparingly. One of the most amazing things a bee does is in the spring and summer, when there are plenty of flowers, bees tell each other where to find nectar and pollen. Isn't that pretty cool? Birds - There was one bird during my Great Backyard Bird Count time that I couldn't identify since it kept hopping all over the place like a warbler and I was never able to get a photo. I had several opportunities since it seemed to be staying around, but every time I'd grab my camera, it's like somebody would shout "Camera Time - Fly!" Finally I got a few good shots and when I uploaded them to the computer, I found it to be a Ruby-crowned Kinglet. This bird moves constantly, even when it's feeding. It's definitely a hyperactive bird. They are only 4.5 inches long so it was small like some warblers. We've never seen them here in winter, but research shows that they do winter in Virginia. We usually had them in the Fall. This one was all over the suet feeder when it could gain access between the bluebirds and a wide variety of woodpeckers. The red patch on the top and back of the head that gives this species its name is not easily seen unless the adult male is excited or raising it in his display to other birds. 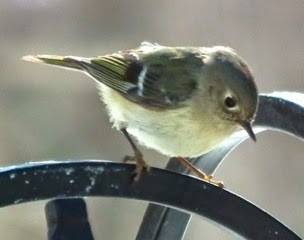 Since there's no mating for the Kinglets here in Virginia I had never seen any red patch. They mate in the coniferous forests of Canada or the Rocky Mountain states. However, I was so surprised to get a view of the patch a few days later and a not-so-bad photo of it. Seven (7) Mourning Doves on the Pond Rocks. Can you find the 7 doves? 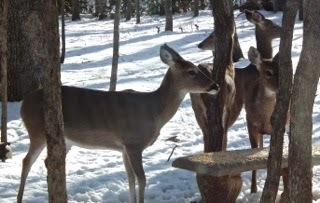 Critters - Mama Love Deer arrived in 2012 as a "teenager" with broken front right leg at knee. Prayer and hope and loving thoughts surely have aided her in still being able to get around and feed herself. The other deer didn't like her which was really sad to see. I would share some of the ground birds corn with her and then others would arrive and chase her away and eat it. We aren't allowed to feed deer in our community so this wasn't a normal practice. There are also health considerations for not feeding deer in the same place, not to mention them getting dependent on an instant meal. One several visits lately she was with a herd of deer (5-7) and seemed to be fitting in, but then a week later she was out back after the ground birds were fed and came around the back of the house alone. Not for long ... I think the deer smell the corn in the cool winter air. Anyway, they chased her away. It was sad ... I wanted her to have friends. She looks good though. Not thin. We've not had a harsh winter as far as temperatures go and snowfall. We all need friends to hang with, even when we think we're just fine alone. We weren't designed to be alone. God made us for relationships. It's a sad world being all alone. 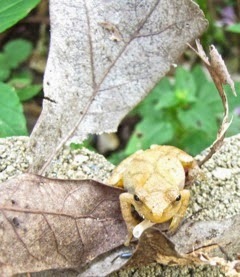 On March 9th it was a warm enough day and evening to hear Spring Peepers. Our first sounds of Spring ... besides the titmouse's constant call for a missy. Oh how lovely! What I miss most in winter is the colors and blooms of the garden and butterflies and the sounds of the night. Even when inside, a moth fluttering on the window is such a beautiful sound to my ears. Spring Peepers are usually found in wooded areas, grassy lowlands, and near ponds and swamps in central and eastern Canada and the United States. These tiny (mature at 1.5 inches), well-camouflaged amphibians are rarely seen, so my getting a picture of one was a very exciting day. They are nighttime creatures spending their days hiding from predators and emerging at night to feed on such delicacies as beetles, ants, flies, and spiders. At mating time they lay their eggs in water and go back to the forest to live the rest of the year. Since we have a small frog pond (as we call it - it's 5 x 10 feet), they must be attracted to our back woods because of the proximity of the pond. 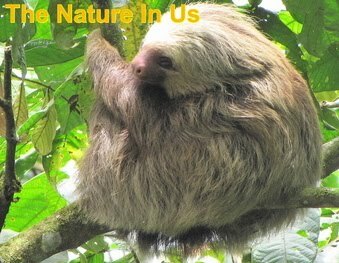 They mate and lay their eggs in water and spend the rest of the year in the forest. In the winter, they hibernate under logs or behind loose bark on trees, waiting for the spring thaw and their chance to sing. The mid-March chorus of nighttime whistles from amorous males is a sign for me that winter is over. If you've not heard Spring Peepers ... or maybe heard them and didn't know what they were, here's a YouTube closeup video of a male singing away with his dewlap huffing and puffing. What is a dewlap? It's a loose flap of skin on the neck of frogs and other vertebrates. On frogs it's part of the vocal sac and makes the calls of the male louder. These calls can be heard for miles sometimes. Travel - Being a distributor of Nature's Sunshine Products has given us many award trips that we have so enjoyed. Sometimes it wasn't a location that would normally be of interest, but I was always surprised at what you can find if you are truly looking for good in life. 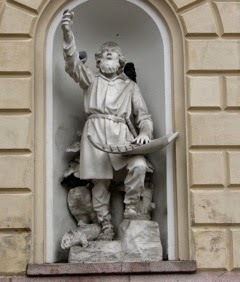 We had an 11-day Baltic Sea Northern Europe Cruise on Holland America. It had many stops in various countries but all cities and being into forests and wilderness I didn't think there would be much to photograph. Fortunately I like architecture, so we ventured out into every country and by the end of the trip it had been my favorite cruise of many that Nature's Sunshine gave us. View Helsinki, Finland Photos. The only one that rises above this one is the Alaska Inland Passage Cruise where we saw so much wildlife. We visited a Raptor Rehabilitation Center in Sitka where we were able to see eagles face-to-face only a couple feet away. Amazing birds when you're that close. Talking With Jesus - I have an aunt in Pennsylvania that delights in giving gifts. She's got a knack for it too cause it seems everything she sends is something that just fits who I am. Not long ago, she sent me a spiritual devotional journal by Marie Chapian. 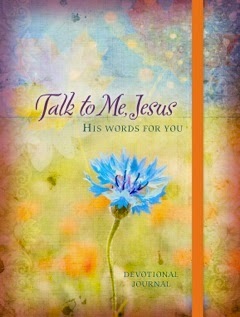 It's titled, "Talk to Me, Jesus - His Words For You." It's absolutely awesome. I love it! When I spend time with Jesus in my secret place, He always has awesome and encouraging things to say to me. Never condemning, drawing me to a higher place of intimacy with Him, which is exactly what the cover of the journal says on the back. Currently my secret place is an abandoned beach with a huge rock that we sit on and watch the water swirl and splash into a little cove below. Nice place for winter, eh? Before that we would stroll through a hardwood forest and it had benches here and there where I would sit on the ground at His feet and simply adore Him. I've always preferred ground to benches. God loves us so much. Artistic - We talk with our son, Benjamin, on weekends and he's always a barrel full of information. He always was a "busy" child with a bright mind and he continues to use that brain to absorb more and more helpful information to share with others. We've learned a lot from him and I can always count on him knowing the latest in techie news and beneficial things online that may make life a bit easier. He's a joy and a blessing to us. 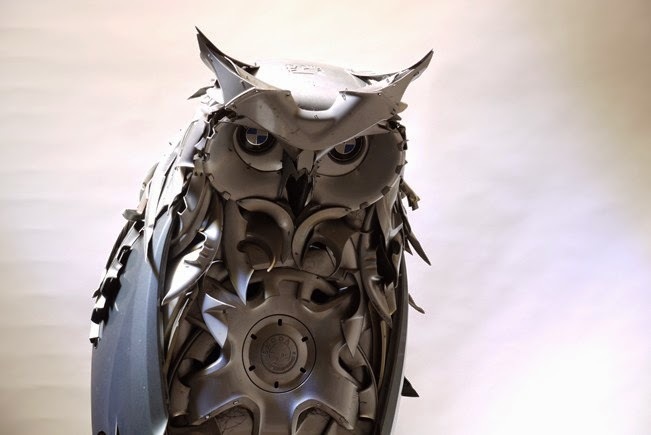 One of the things he shared on a previous conversation is a site that has "sculptures" made out of hubcaps. The artist lives in Brighton, England and gathers hubcabs from roadways and turns them into amazing and beautiful art forms. The owl you see was one of Ben's favorites and he thought I would greatly enjoy it also. Not as in actually buying ... but enjoy looking at it. The prices are pretty steep, but it's wonderful to get to look at no charge at all. The Arctic Wolf is another one that is quite amazing and was his favorite. The cost converted to US Dollars? $11,580! It's almost 4 feet tall. I very much enjoyed exploring the website and seeing how detailed these creations are. Interested in seeing more? I enjoyed the Buy Work and Previous Work links the best. Visit Hubcap Creatures website. Closing Thoughts - Spring officially arrives on Friday. It's incredible to me how quickly this winter has flown by. I know it's because I changed my attitude about winter. I didn't do anything different but look for the good in each day and express thanksgiving and praise for the sun on days when it would shine, and that was most days. We didn't have very many dreary days of winter. Had 4 snowfalls all 6 inches or less. Very blessed compared to the rest of the northeast area. Oh! to see leaves and flowers again. How wonderful is God's creation! 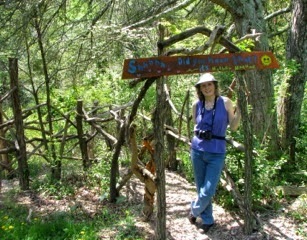 It's time for nature walks!